It has been another great week of amazing tables dressed for Christmas! I am so honored to have all of these talented bloggers share their tablescaping talents. 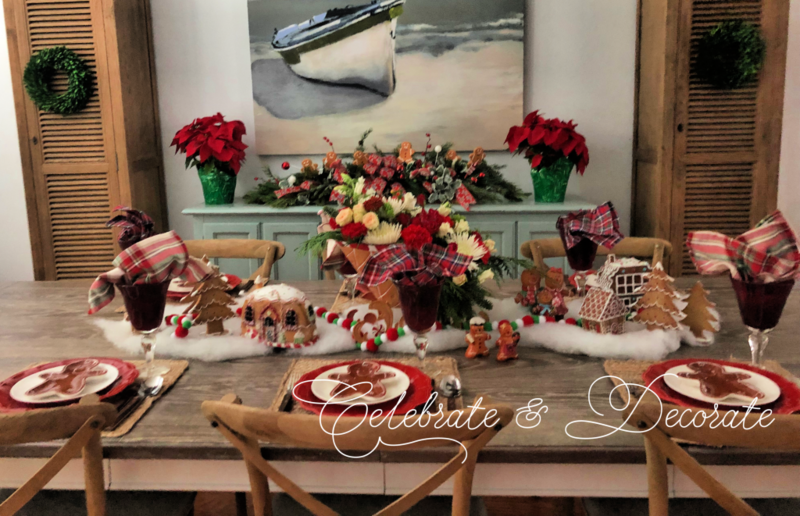 It is so fun to browse all of these great blogs and see the different ways that tables can be styled for Christmas. In keeping with my fun gingerbread and candy themed Christmas throughout the house, I have kept my table fun and light. 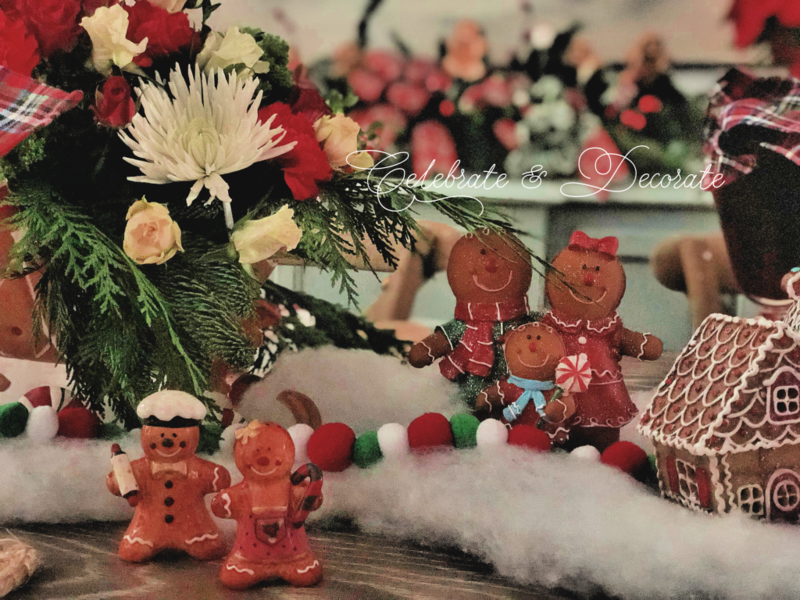 Gingerbread figures and even a gingerbread salt and pepper shaker couple dance down my table. These sweet little gingerbread dessert plates top my plate stack. I know these will be used for some delicious Christmas cookies and maybe even some yummy appetizers! Plain white salad plates make a nice base for my little gingerbread man and red Pioneer Woman Crackle Glaze plates give a holiday feel. Hemp placemats carry through the casual feel, as does the wooden handled flatware. Faux gingerbread houses and figures are nestled on artificial snow down the center of the table. 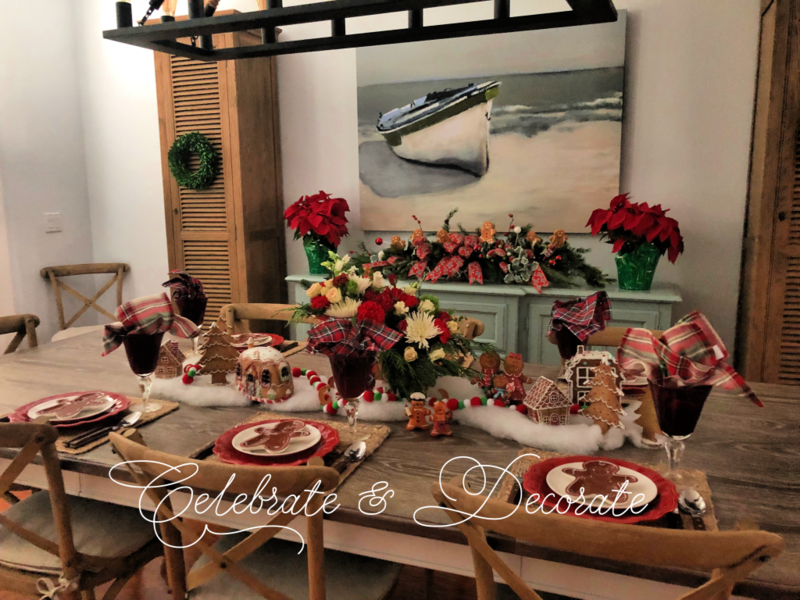 The crowning glory of my centerpiece is my “gingerbread” sleigh, filled with Christmas greens and red and white fresh flowers. Ruby red goblets finish my place settings. I broke all of the napkin rules by using assorted Christmas plaid napkins tucked into the goblets. My gingerbread man themed arrangement on my sideboard along with a pair of poinsettias completes the look of my casual Christmas table. Now, please take a little time and visit these great blogs by clicking on the links below! Let them know how you like their tables! Thank you so much for your kind compliments, Mary. I am so happy you continue to hop along with me and all of these other talented ladies! Chloe, I couldn’t wait to see your table with your theme this year. Once you showed your ladder and then various other Christmas decor, I knew it would be a treat (no pun intended!). That centerpiece is definitely a wow in the gingerbread design (arrangement beautiful too!). The little houses, the gingerbread men plates, and that cute pom pom garland weaving through the snow make it all come together in such a fun way. No rules for table stylists, but if there are, you’re my kind of woman breaking them with those plaid napkins in the red goblets. Love that! The honor is truly mine to be in your company for this table styling event, Chloe. Wishing you and your family a very Merry Christmas! I know it will be for your granddaughters, especially, with this year’s happy theme. Thank you so much Rita, you are so dear and I am so happy to have gotten to “know” you through this blogging world! 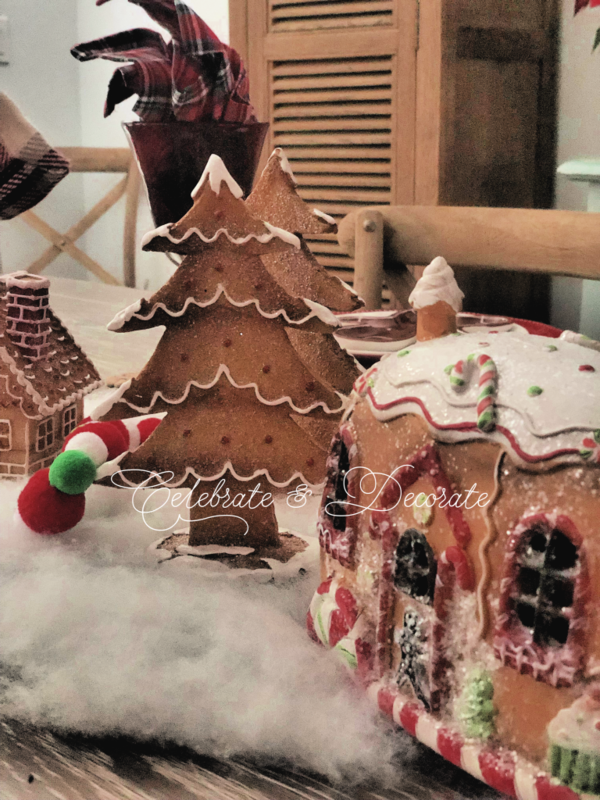 I have really gone gingerbread crazy this year and have had so much fun with it! Merry Christmas! Your table is adorable! Love the gingerbread sleigh and houses. The floral arrangement is beautifully done. I never thought to use my felt ball garland like that- great idea! The plate stack is adorable. I don’t think I’ve ever seen gingerbread plates before. Your whole room looks wonderful! Chloe, Love your table and buffet! That sleigh is the crowning glory! Your flowers and greenery in the sleigh with the plaid fabric make a grand statement and the pom pom garland is adorable. Very effective to place the different plaid napkins inside the goblets. 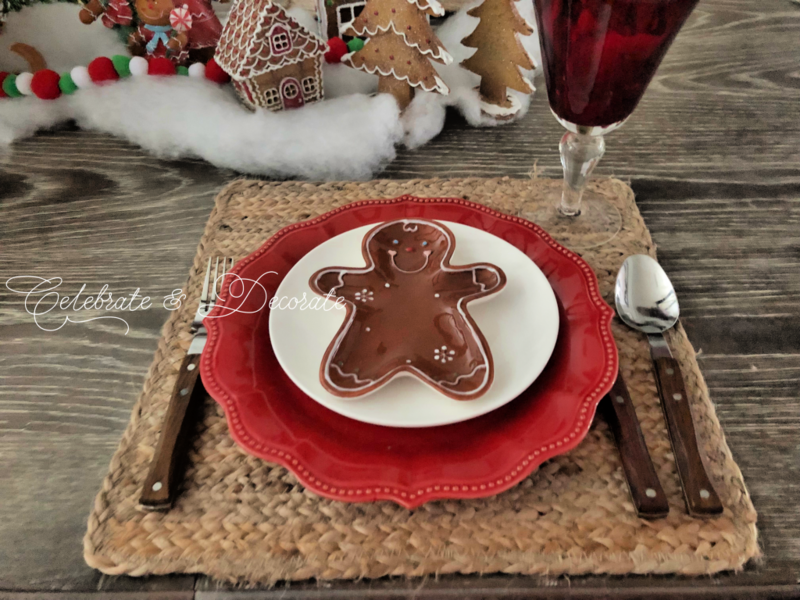 I love the red plates with their fun texture and shape with the cute gingerbread dessert plates. Thank you for all you do to organize the blog hops. They are fun! A gingerbread sleigh!! Wherever did you find that Chloe, it is wonderful!! I can picture the smiles and grins from your grands when they sit at this table, so happy and fun! I think it’s so great that you are embracing this special time with them and making memories of a Christmas they will never forget…it can’t be easy with them undoubtedly missing their moma, but at least during the holidays there are lots of things to distract them, like your home full of gingerbread and candy! Thank you so much for all your hard work and time spent keeping our hops going, we love and appreciate you Chloe! My dear friend you have scored another hit not only with all of us, but with your little grand daughters too. The gingerbread is so whimsical and nostalgic at the same time. Love it! All the elements of your table make me want to stop what I am doing and come sit at your table and imagine I am a kid again. (Wow) yes, I can still remember being a kid again, (I think)! I love the use of fresh flowers in your darling sleigh centerpiece. It is so beautiful. BTW…the final boot comes off this week so now I can’t use the excuse of a broken foot. Gee, I will have to find another excuse for being so behind. Adorable!! You know I am a gingerbread fan!! I love those trees and of course that wonderful sleigh!! I need your little Gingerbread family – I keep looking for one, but haven’t found one I like yet – I do like yours. That pompom garland is so cute! Your whole table just makes me smile. It is a delightful way to celebrate Christmas. Thank you so much for organizing this hop – it has been a lot of fun and very inspiring! I hope you and your family have a very Merry Christmas. Thank you so much Ann! I appreciate you continuing to share your styling talents with the blog hops! Merry Christmas! Chloe, this is adorable! I absolutely LOVE your gingerbread sleigh, but my favorite part is definitely your assortment of plaid napkins! I know your house is full this season and hope that you and your family have a wonderful Christmas of magic, peace and happiness! Such a festive tablescape, adorable for young and old….and of course you will have to serve hot chocolate and gingerbread….Grins! I love your Gingerbread tablescape! Your floral sleigh centrepiece is gorgeous! Your gingerbread houses and trees are adorable. Using a variety of plaid napkins tucked into the red goblets are so pretty! Thank you for a year of fabulous tablescape inspiration. It is always an honor to participate in the blog hops! Thank you so much Maureen for your kind words and thank you for contributing your talents to all of the ongoing blog hops! Merry Christmas! Fun and light indeed and the sleigh is amazing!! This is an all age table and I would love to have a seat here. I know there are lots of other things you could devote your time to and I appreciate you giving us some many opportunities to share our passion. What a darling theme! Love the houses and the gingerbread men plates! My inner Queen of Theme is absolutely loving all your gingerbread holiday decorations, tree and now this adorable table. So, so cute! Your granddaughters must be over the moon in your festively decorated home. Thank you so much Debbee! I don’t think the house has ever been quite so decorated! Merry Christmas! Chloe, your Gingerbread table is so cute. l love your sweet collections. The houses, the little men, what’s not to love. Brings back memories. 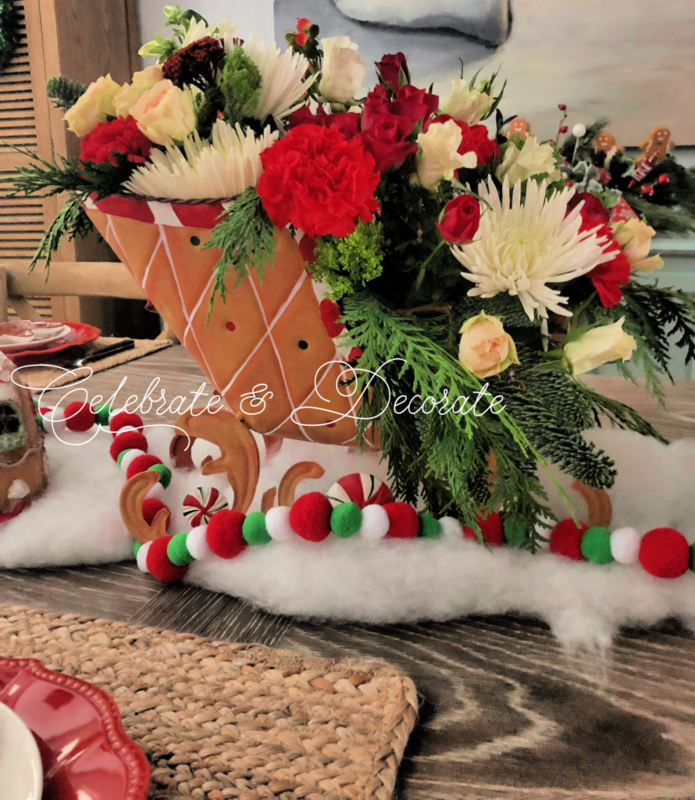 The centerpiece with gingerbread sleigh is so pretty filled with lovely flowers. I bet your sweet granddaughters love this. Who wouldn’t smile seeing this sweet table. 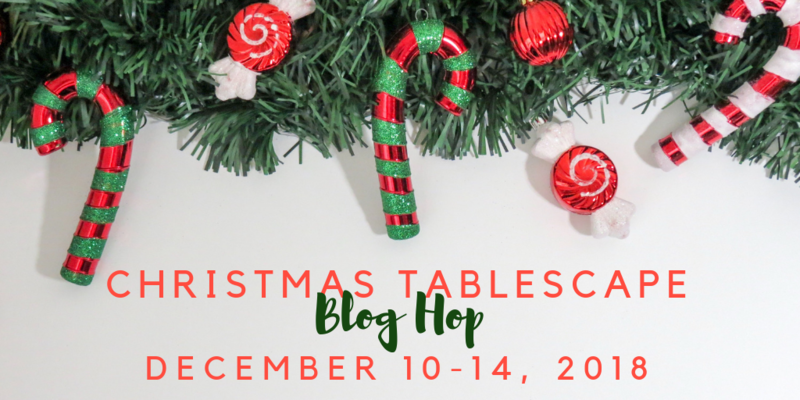 thank again for including me in your Christmas tablescape blog hop. 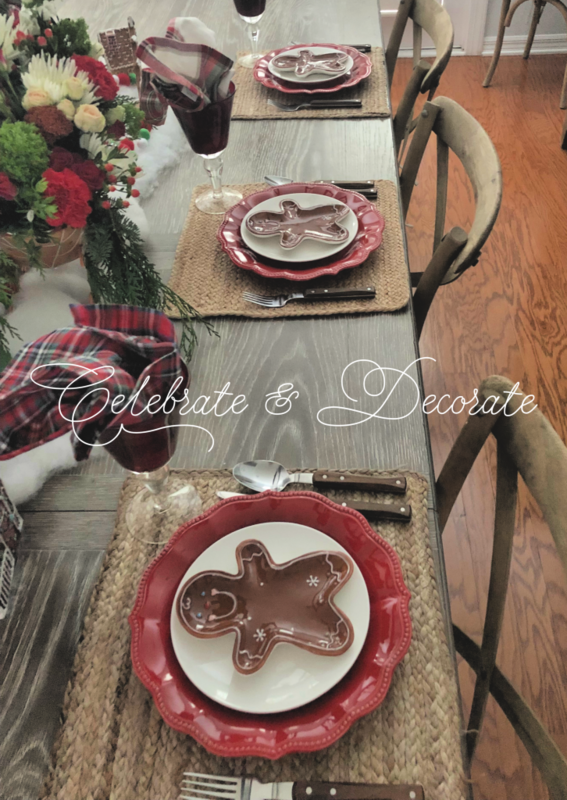 Chloe, the gingerbread plates are so cute and make a great focal point for the place settings. I love the festive and playful feel of the tablescape. The plaid napkins are perfect for your table and the sleigh is a great centerpiece. Thank you sooo much again for being the best tablescape blog hop hostess. Hugs and Merry Christmas. Thank you so much Carol! It is a casual and playful table, different for me. I wish you a very happy holiday dear friend! 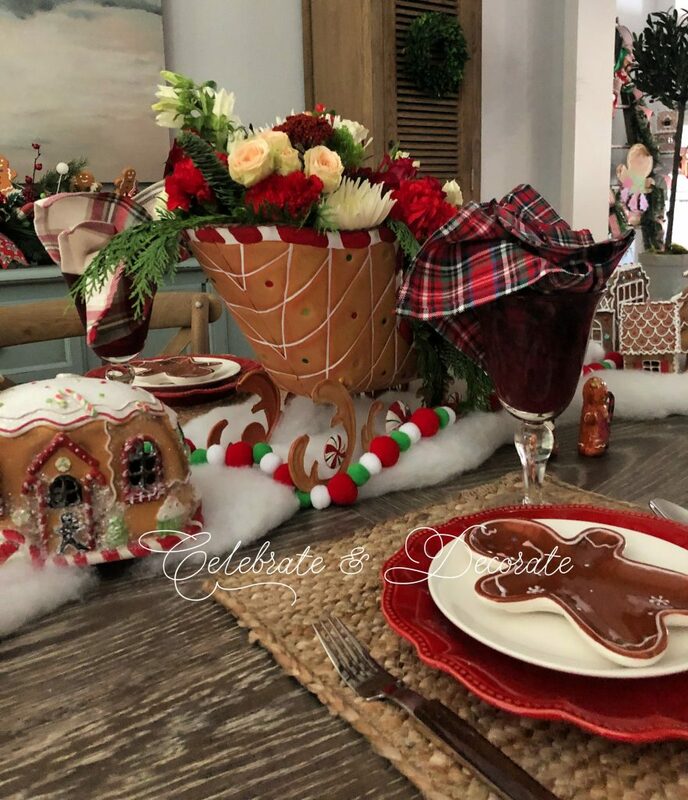 Oh my goodness Chloe, I just love your gingerbread themed tablescape – what a fun theme to work with! Those gingerbread plates are just adorable. I love the fresh flowers in the centerpiece along with the gingerbread houses. Thank you so much for inviting me to join the hop – it’s been a blast and everyone’s tablescapes are so gorgeous! Thank you so much Michelle! Isn’t it crazy how many different looks can be translated into a Christmas table? Simpatico l’omino di pan di zenzero. Bella e allegra la tua tavola. Spero di riuscire a trovare qualche ispirazione per una delle mie tavole durante le vacanze! Che bella la tua tavola. Chissà se si trovano, in Italia, queste ciotole a forma di omino di Pan di Zenzero! Passerò a riguardare il tuo post, per ispirarmi per una delle tante tavole che preparerò dalla Vigilia di Natale all’Epifania, qua da noi abita il Bis Nonno e tra figli con mogli e mariti, nipoti (mogli e fidanzati) e pronipoti siamo sempre in compagnia! When it comes to decorating I believe some rules are made to tbe broken! I love how you used different plaids in the goblets. 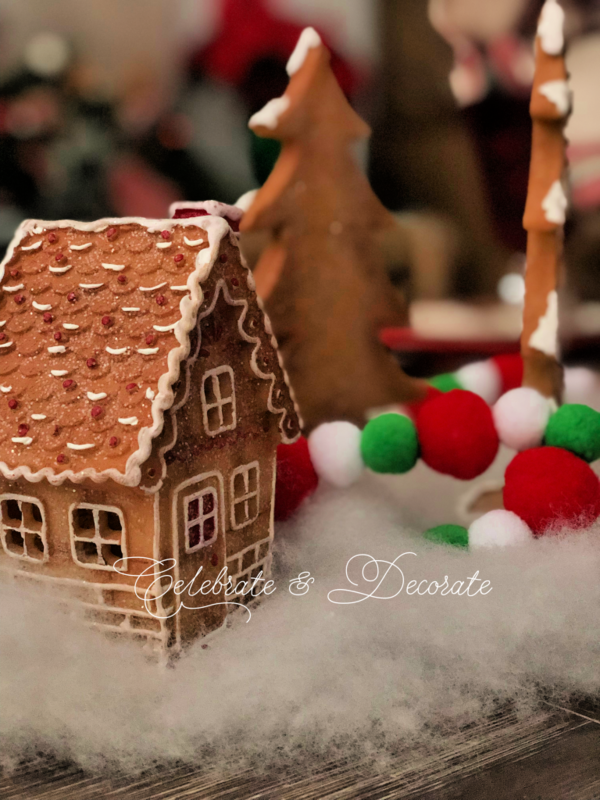 Your faux gingerbread houses look so real, and I love the whole idea for your table. I really just love gingerbread men! 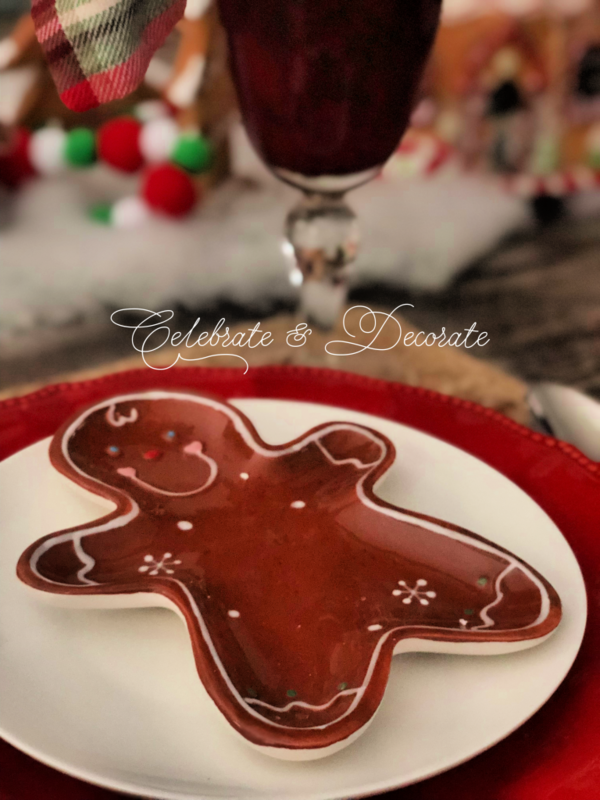 I am not sure if you saw my post from last week, but I made gluten free/vegan refined sugar free gingerbread cookies and gingerbread men for the first time, and they turned out amazing! Now I can enjoy a gingerbread cookie after 8 years of being on a strict allergy friendly diet. I decorated with of them in my kitchen too. I just think you whole table is so adorable. Thank you so much for hosting this hop. Merry Christmas! Thank you so much Amber! Thanks for joining us again! I appreciate all of your hops you have invited me to join in, too! I understand about allergies, my daughter in law has a lot of food allergies! I am glad you found a recipe you can enjoy! Chloe, your grands must LOVE this table! I’d say it brings out the kid in all of us. The fresh evergreens and flowers in the sleigh are so pretty. I love the added pops of color with the peppermint candies and pom pom garland. Those gingerbread trees look good enough to eat! And who says napkins need to always match? I think your table looks even better with a mix of plaids. Thank you so much for organizing this hop! I really appreciate the work you do that makes this a fun and rewarding event for so many people. Have a very merry Christmas with your family! Thank you Rebecca, the girls have loved all o the candy and gingerbread theme at my house this year! What a fun table Chloe! You never cease to amaze us, thank you for sharing such a whimsical table with all of us. I am pretty sure your grand daughters will keep this year’s experience as one they will never forget. Happy Holidays with your family in Joy, Peace and Love.